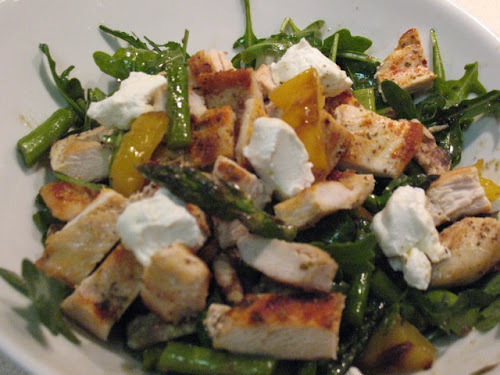 This salad recipe uses the simple broiled asparagus from Monday, cooled and chopped and tossed with the other ingredients. It's a great mid-week recipe: quick, simple, healthy and tasty. If you are lucky enough to be able to barbecue, I bet this would be great with grilled asparagus and chicken. 1. Toast walnut halves in a small frying pan over medium-low heat until fragrant and lightly browned. Set aside to cool. 2. Heat 2 tbsp. olive oil in a medium frying pan over medium heat. When hot, add chicken breast cutlets to pan, season with salt and pepper and cook until done, about 10 minutes turning halfway through. Remove from pan, cool and slice. 3. To make dressing, whisk together olive oil, vinegar, mustard and honey, seasoned with salt and pepper to taste. 4. Combine asparagus, arugula and yellow pepper in a large bowl. Toss with dressing. Divide into plates and serve topped with goat cheese, walnuts and chicken. This is good! The combination of ingredients works really well. I particularly like the goat cheese.